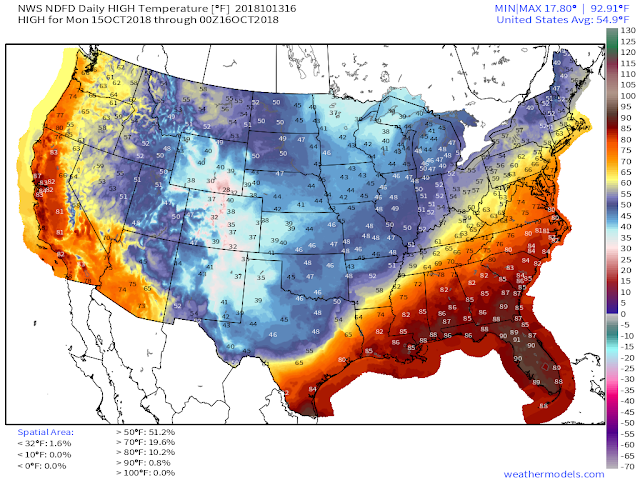 Round One Is Done - Round Two: Winter Arrives Sunday Night Into Monday. 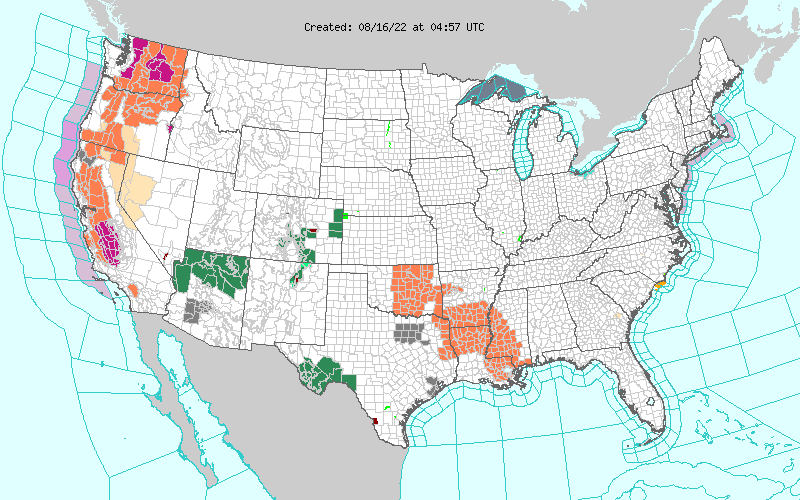 Blog Updated At 3:39 PM MDT Saturday Afternoon. 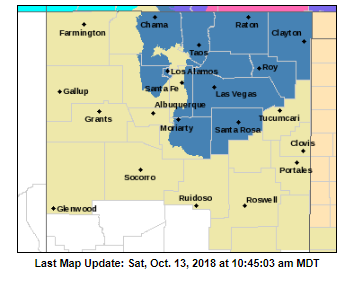 Round One Has Passed - Next Up Winter! 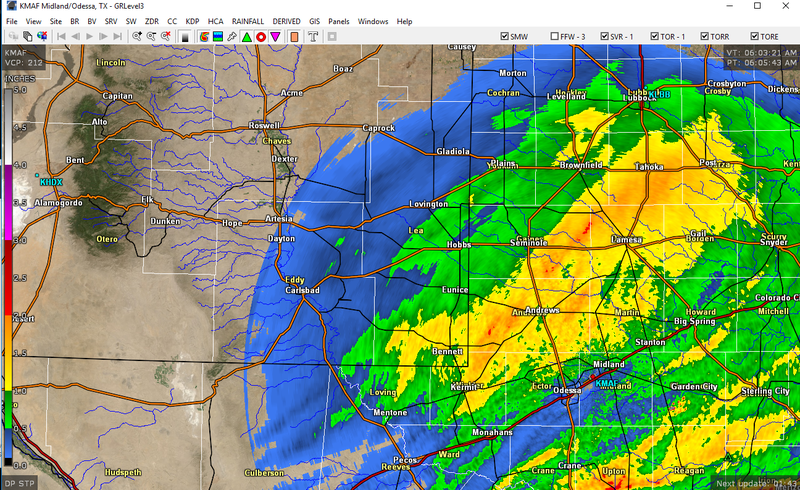 Measured & Estimated 24-Hour Rainfall Totals. 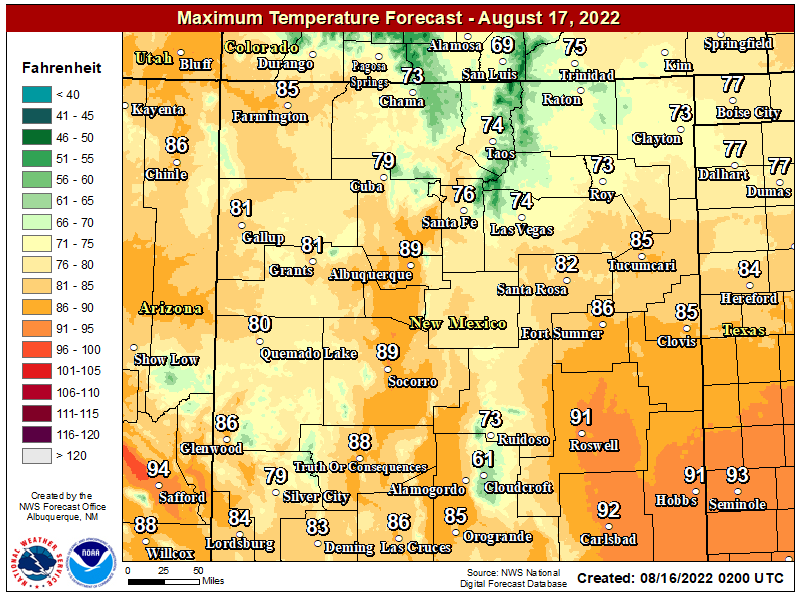 (As Of 6 AM MDT This Saturday Morning). 24-Hour Radar Estimated Rainfall Totals. 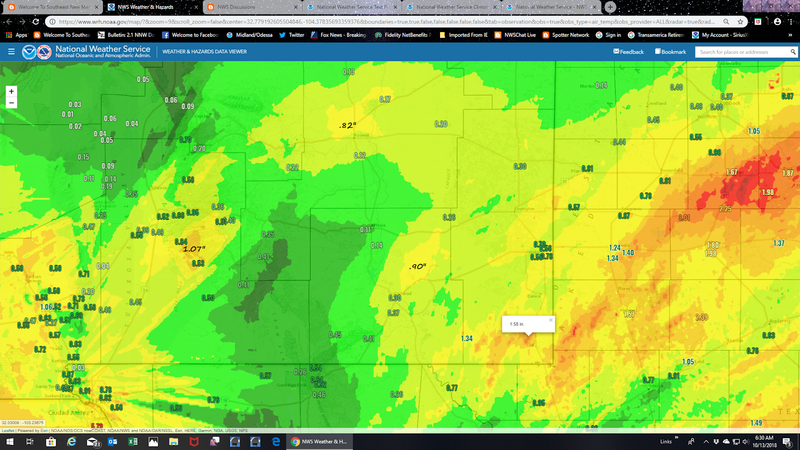 West Texas Mesonet 24-Hour Rainfall Totals. What was left of former Hurricane Sergio (his remnant tropical moisture) zipped overhead and across the area yesterday aftrnoon into the early hours of this Saturday morning. 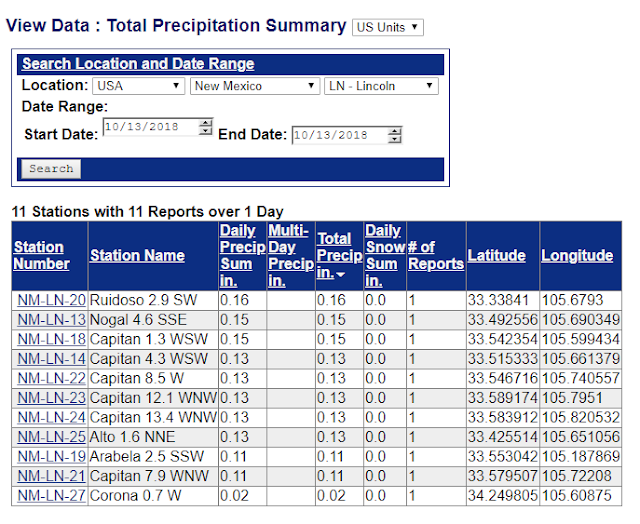 Storm total rainfall amounts varied (which is typical many times for us). 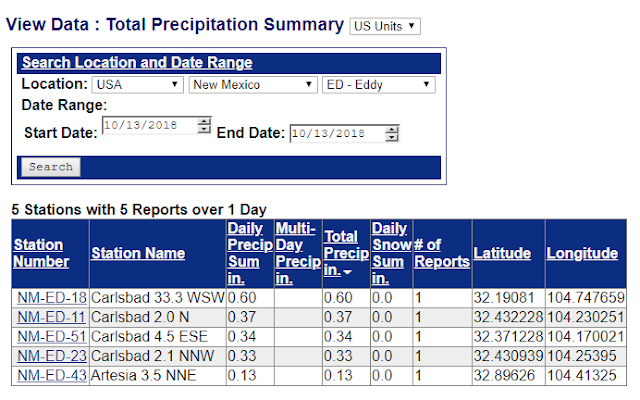 Locally the highest estimated rainfall totals from radar and satellite data fell between the WIPP Site east of Carlsbad and Jal in far southern Lea County. Totals there were estimated at around one inch to an inch and a half. 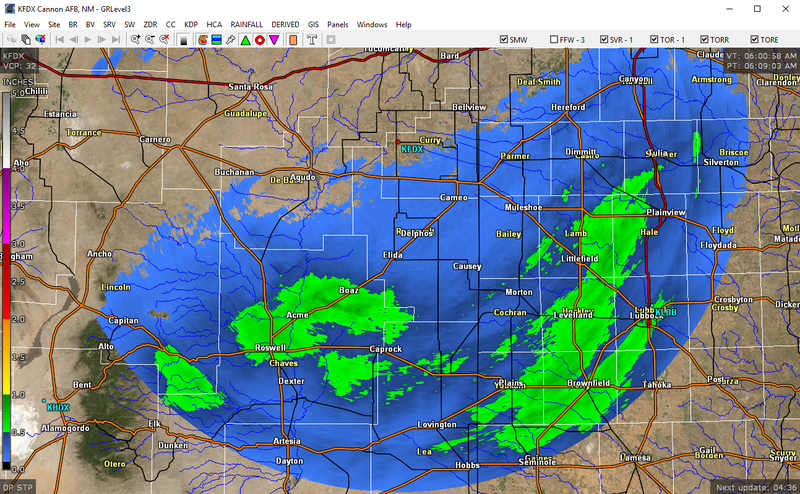 Other estimated totals ranged from close to .80" north of Roswell and .90" northeast of Carlsbad. 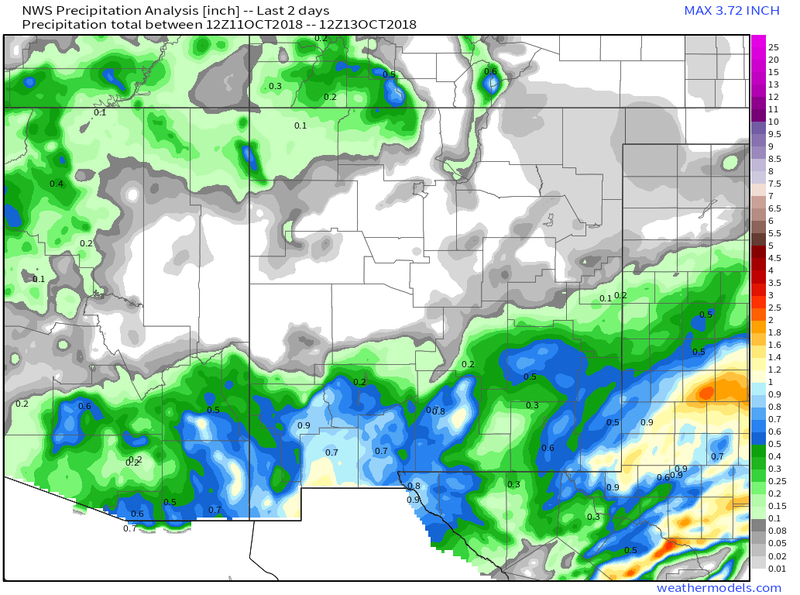 Around an inch of rain may have fallen west of the Weed and Sacramento areas in the southern Sacramento Mountains. A CoCoRaHS Station located 2.3 miles south of Cloudcroft reported a total of 1.09". While the Paduca Raws (Remote Automated Weather Station) located southwest of the WIPP Site reported 1.34". North Red Hillavs Dis Vantage Pro PWS. Davis Vantage Pro PWS Location Map. 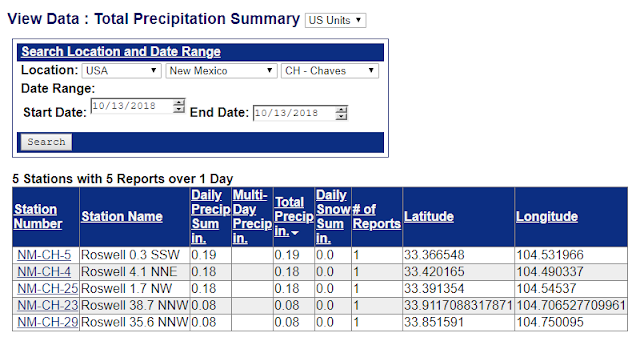 A Personal Weather Station (PWS - Red Hills) located 21 miles west of Jal just south of State Highway 128 reported a storm total of 1.90" this morning. Midland NWS Doppler Radar Estimated 24-Hour Rainfall Totals. 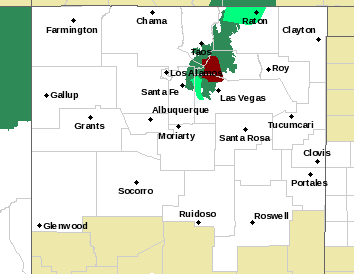 Cannon AFB Doppler Radar Estimated 24-Hour Rainfall Totals. 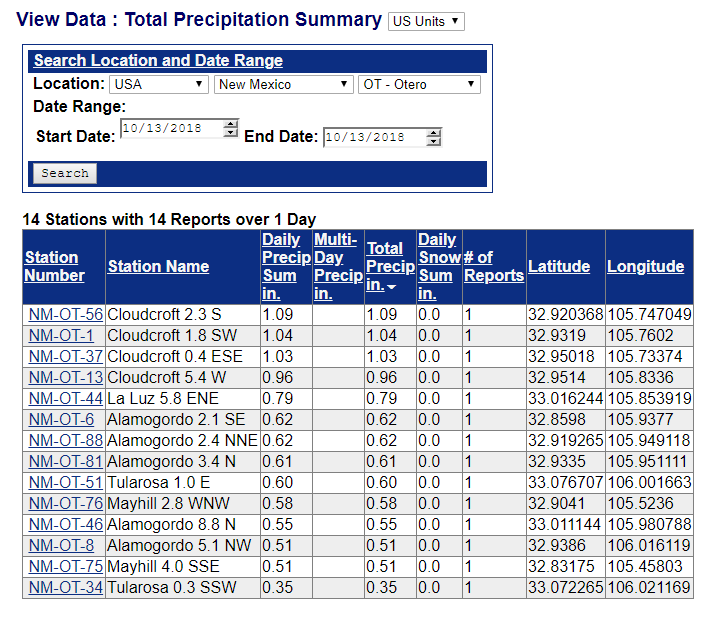 NM CoCoRaHS 24-Hour Raitnfall Toals. Skipping Fall & Heading Straight Into Winter. 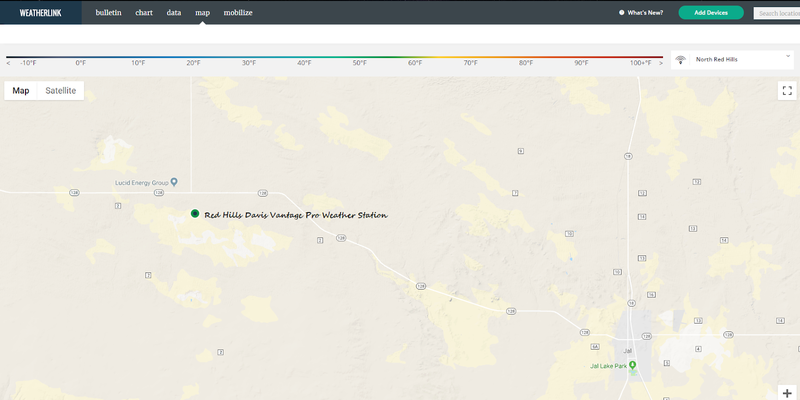 Click On This Link To Open Up The Map. Then Point And Click On Your Area Of Concern On The Map For The Latest Weather Updates Including Watches, Warnings, Current Weather Conditions, And Forecasts. 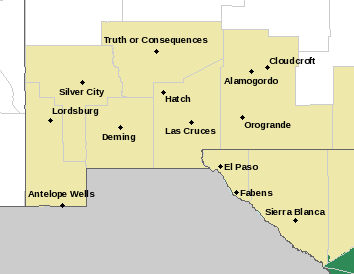 New Mexico Winter Weather Hazards & Forecasts. (For Those Areas Shaded In Blue). Valid Sunday Morning Through Monday Morning. 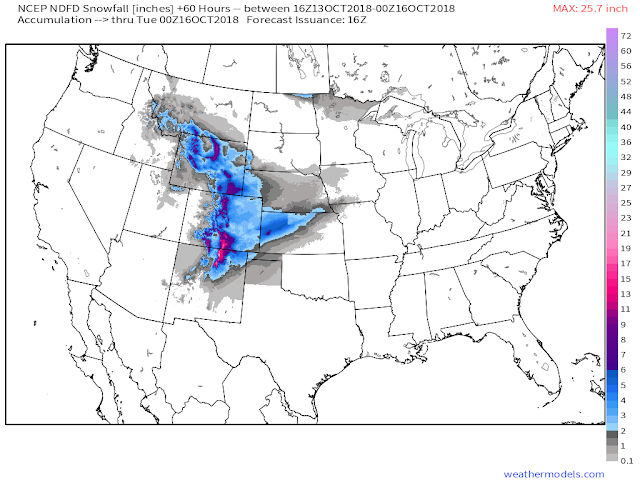 NWS NDFD Storm Total Snowfall Forecasts. 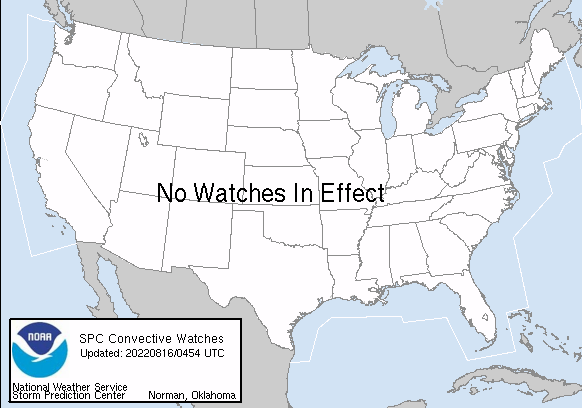 Valid At 6 PM MD Monday Evening. 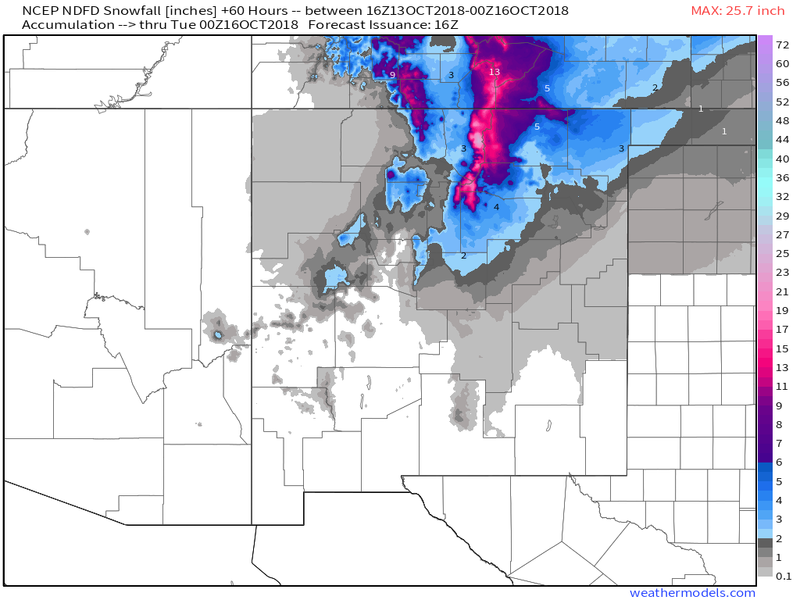 Heavy snow is forecast to fall over the northern mountains of New Mexico Sunday into Monday. The higher peaks could see totals of up to two feet! The Northeastern Plains may see around 4" while light freezing rain and freezing drizzle will be possible across the Eastern Plains. Light snow could possibly fall as far south as the Roswell area late Sunday night into Monday morning. Their forecast low is 33º Monday morning. Snow is also forecast to fall in the Ruidoso and Cloudcroft areas but at this times it appears that it will be light. 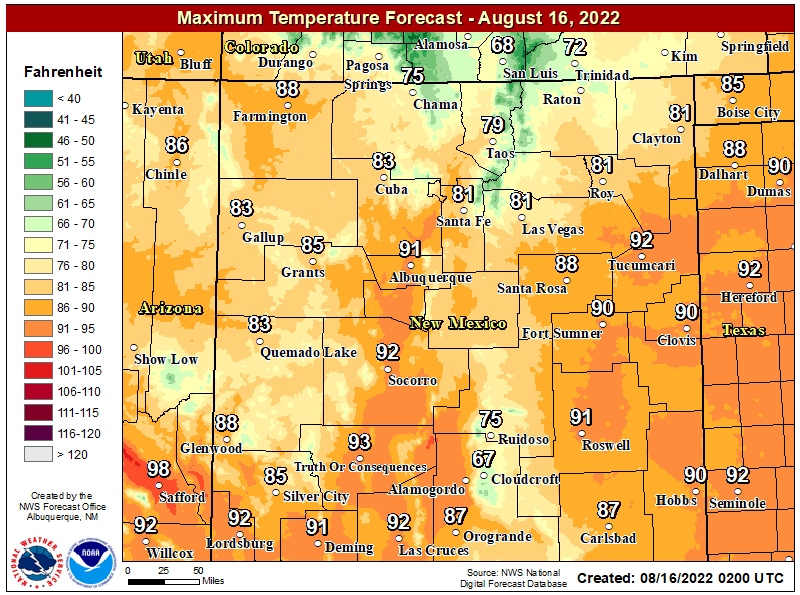 NWS NDFD Forecast High Temperature Forecasts. 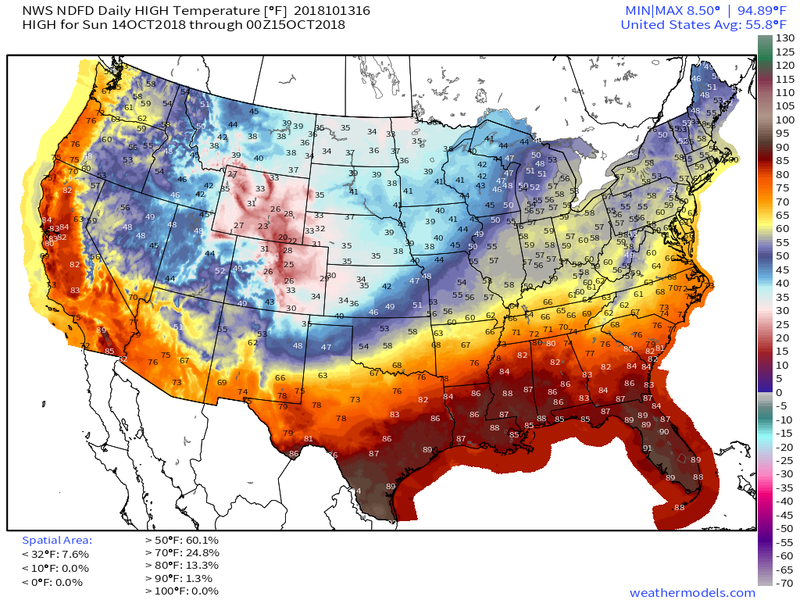 NWS NDFD Forecast High Temperature Anomalies Monday. 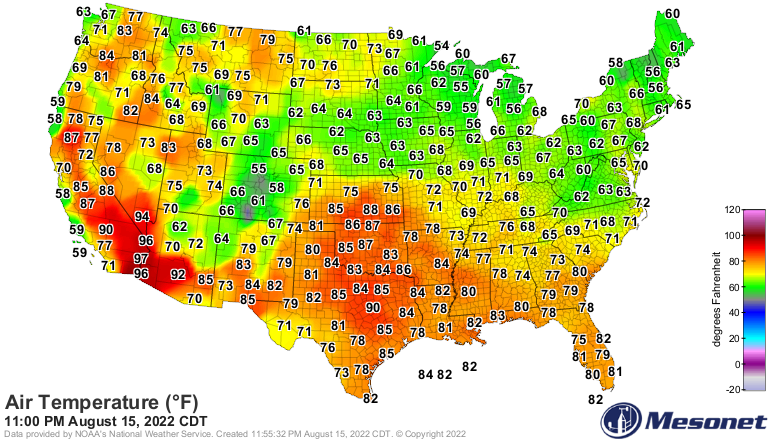 Rapidly Falling Temperatures Behind The Cold Front! 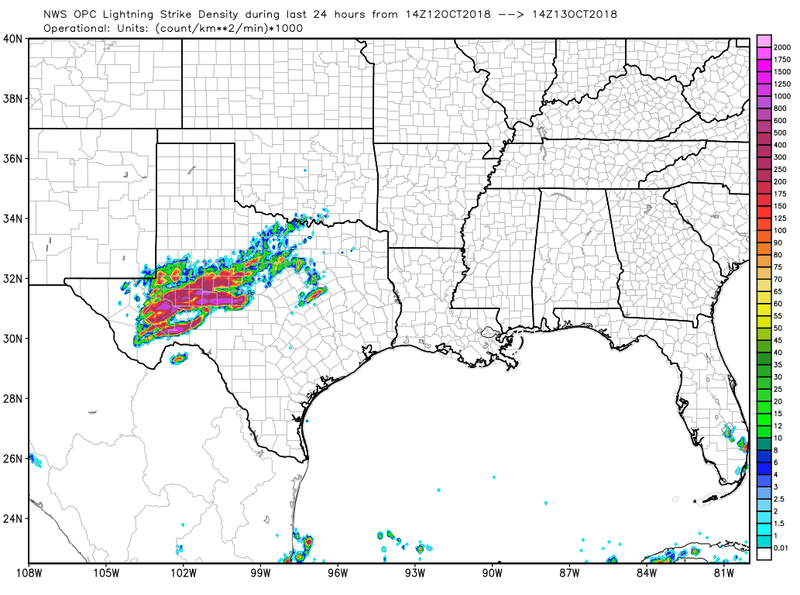 Valid At 6 AM MDT Monday Morning. 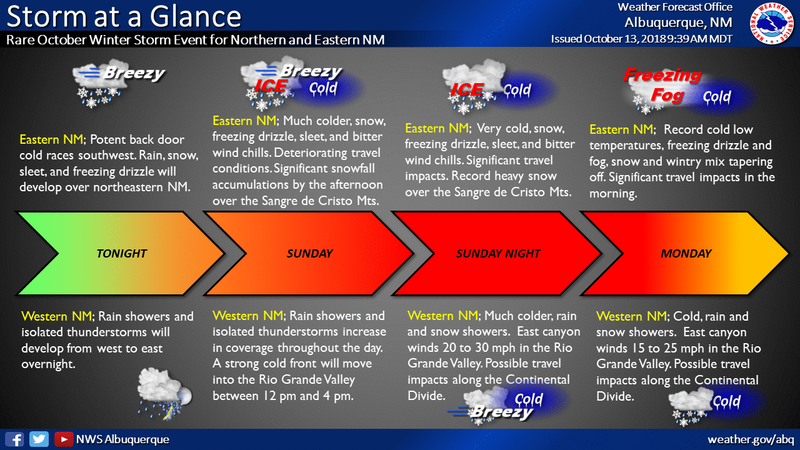 A very strong winter-like cold front is forecast to plow southward into Northeastern New Mexico by mid-day Sunday. 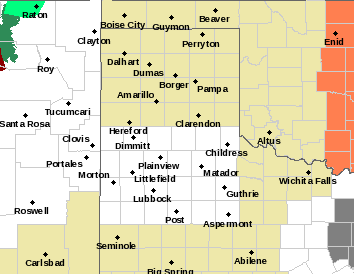 This front will then work its way southward and westward into the Eastern Plains Sunday afternoon. 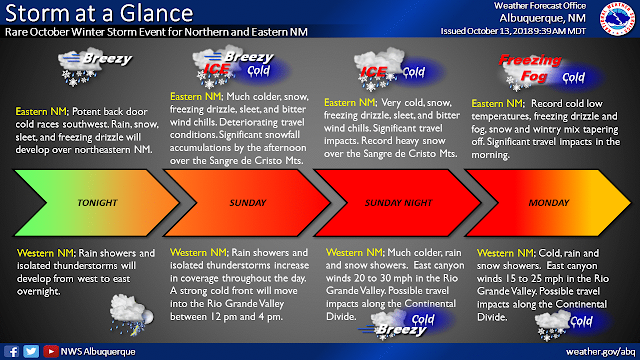 It is then forecast to arrive in Southeastern New Mexico Sunday night. 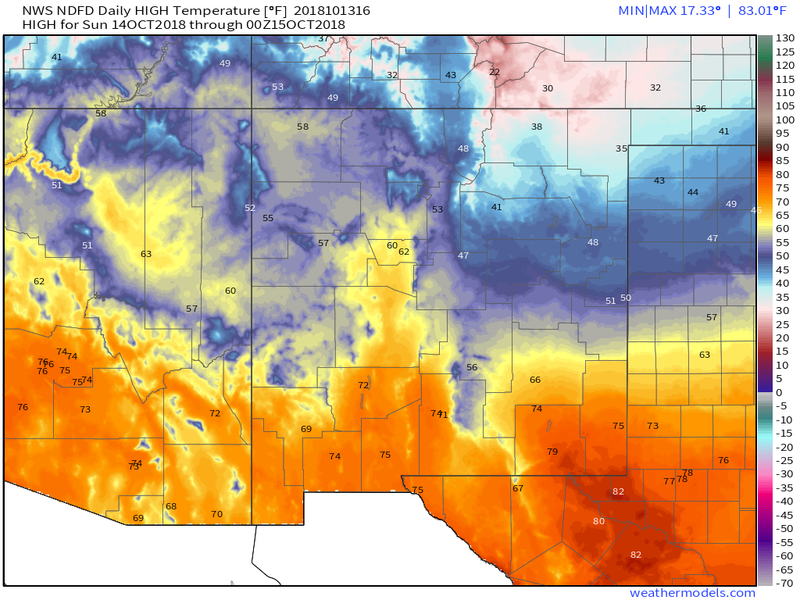 After seeing high temperatures on Sunday in the mid to upper 70's and a few spots near 80º Southeastern New Mexico and nearby residents are in for one shocking temperature drop come Monday. 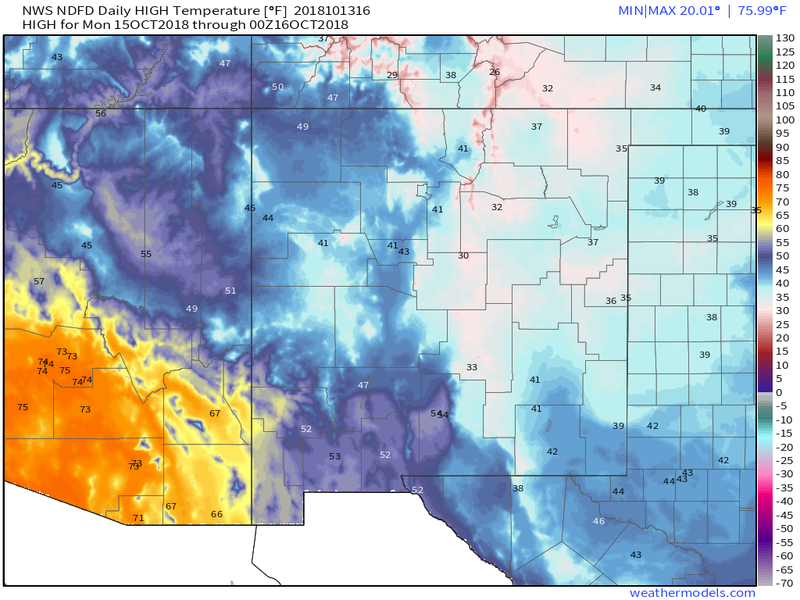 Forecast highs currently indicate that most of the local area will only see readings in the upper 30's to low 40's for highs on Monday. Our highs on Monday will be some 30º to 40º below normal! 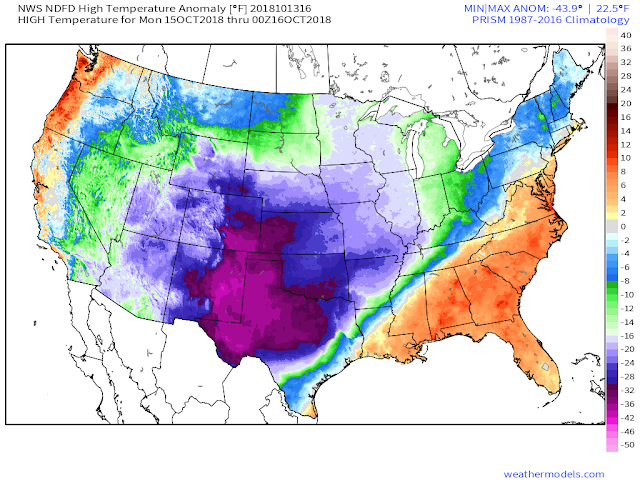 This combined with a stiff north to northeasterly wind gusting between 25 - 40 mph behind the frontal boundary will add to the winter-like chill Monday. 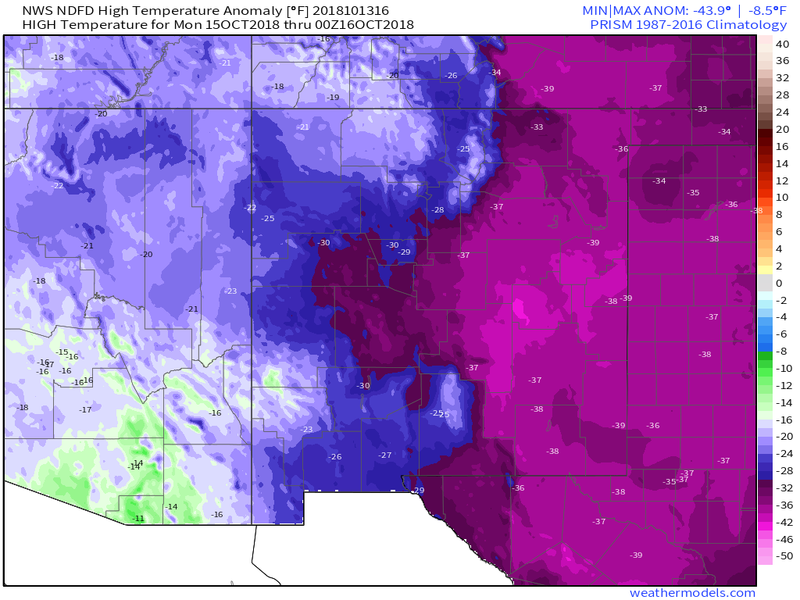 In fact forecast wind chill values in Northeastern New Mexico are expected to drop down into the single digits and teens Sunday. 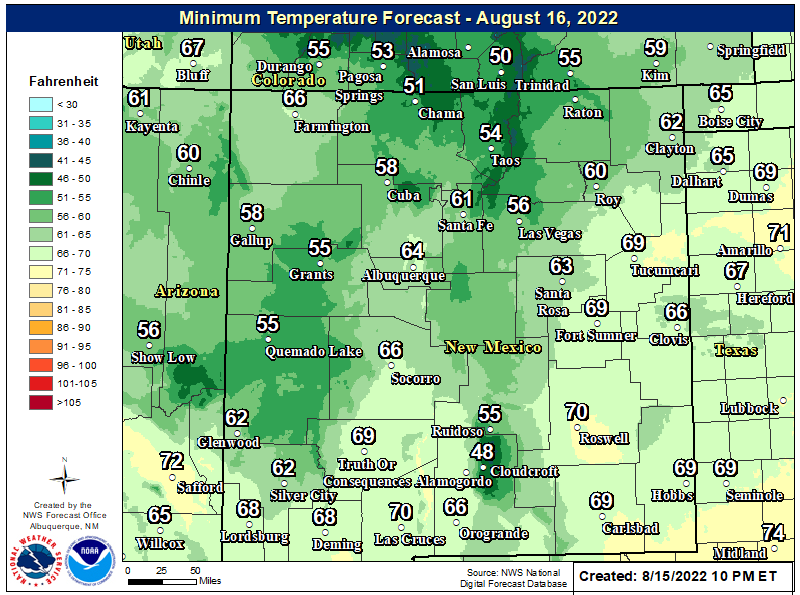 Most of the local area will likely experience record low maximum temperatures on Monday. In fact we are just going to blow many of these out of the record books by a substantial margin. Below are some of the coldest daytime highs on record. 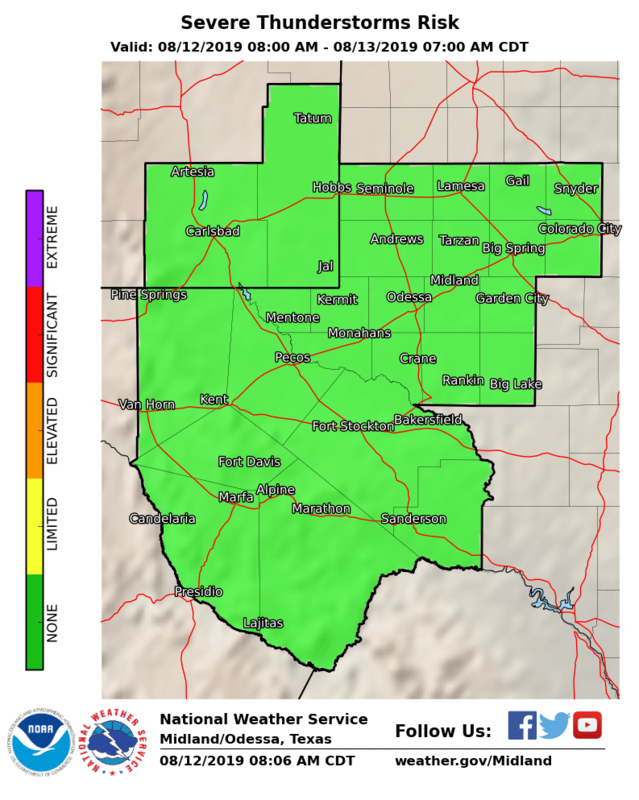 A cold rain or drizzle is forecast locally late Sunday night into Monday morning. 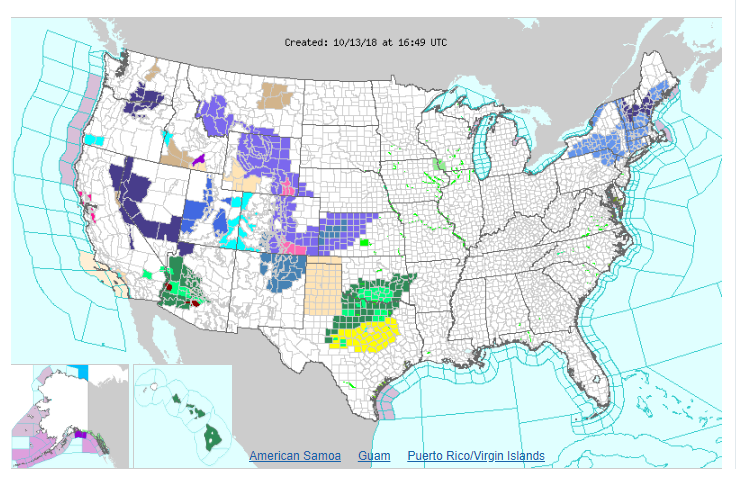 This remains a complicated forecast so please check our local forecasts often for any changes and updates.